Though usage has again ticked up since the prior year, the number of shops reporting consistently consulting OEM procedures still remains far lower than where it ought to be, the most recent “Who Pays for What?” survey concluded. CRASH Network and Collision Advice reported that a larger proportion of the 494 respondents reported checking OEM instructions at least “some of the time” than in 2016. The percentage of shops who looked up OEM repair procedures “most of the time” or always grew to 48.8 percent, up from 48.2 percent in 2016 and much better than the 42.7 percent in 2015. It’ll be interesting to see if the July 2018 “Who Pays?” survey records a greater use of OEM repair procedures in light of the $31.5 million verdict against a shop who the jury found exacerbated the injury to a couple in a fiery collision by deviating from Honda’s instructions on repairing their 2010 Fit. Plaintiffs’ attorney Todd Tracy’s announcement of the lawsuit came in late July, after presumably some of the “Who Pays?” participants had already given their responses. The verdict came in Oct. 2. Learn more from Collision Advice CEO Mike Anderson during the SEMA show with “100% Disassembly Best Practices – with Parts Mirror Matching.” Looking for more guidance on OEM repair procedures? Try Dave Gruskos of Reliable Automotive Equipment’s “Get Attached to Following Procedures: A Comprehensive Guide to OEM Joining” or Larry Montanez of P&L Consultants’ “How to Find, Read and Understand OEM Repair Procedures.” The sessions are part of the Society of Collision Repair Specialists’ Repairer Driven Education Series Oct. 30-Nov. 3. Register here for the individual classes or the series pass package deal. The study does seem to indicate shops shifting into categories where they’re at least accessing repair procedures more frequently. For example, more shops reported checking instructions “most” or “some of the time” than in 2016, while the percentages reviewing them “only occasionally” or “never” both fell. Unfortunately, the number of shops checking them on every repair fell 0.3 percentage points. 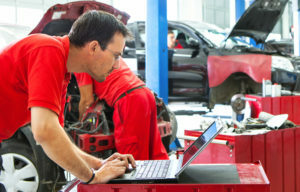 The “Who Pays?” survey also shows an interesting increase in the percentage of shops using I-CAR’s Repairability Technical Support portal and actual OEM websites to access procedures. 46.6 percent of the 1,057 respondents said they used the I-CAR RTS, which provides links to the actual OEM websites as well as additional commentary by I-CAR, an increase of nearly 6 percentage points since the 2016 survey. The formal OEM websites saw nearly a 10-point jump from 2016. ALLDATA remained ahead of them both at 68.2 percent, down slightly from the 68.8 posted in 2016. Shops were allowed to select more than one answer, so it’s hard to read too much into this growth and decreases in some of the third-party aggregators. However, the increased use of the I-CAR and actual OEM sites might be welcomed by automakers and others who argue that the third-party repair instruction aggregators can’t keep up with the actual OEM procedure websites.